one post for The Play Date Cafe challenge. 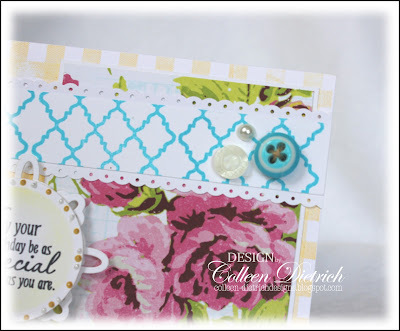 Though this style is not "me", I immediately thought of stamping because of the patterns I saw. The pillows feature yellow gingham, and the tan pillows have a pattern (kind of Moroccan) just like my Skipping Stones Designs stamp. The floral could be represented with paper. The Gingham stamp is by Market Street Stamps, the Moroccan pattern by Skipping Stones, and the lush floral paper is Girls' Paperie. The sentiment is Verve. I used Liquid Pearls in yellow and white to surround the sentiment, and a bit of light yellow shading too. 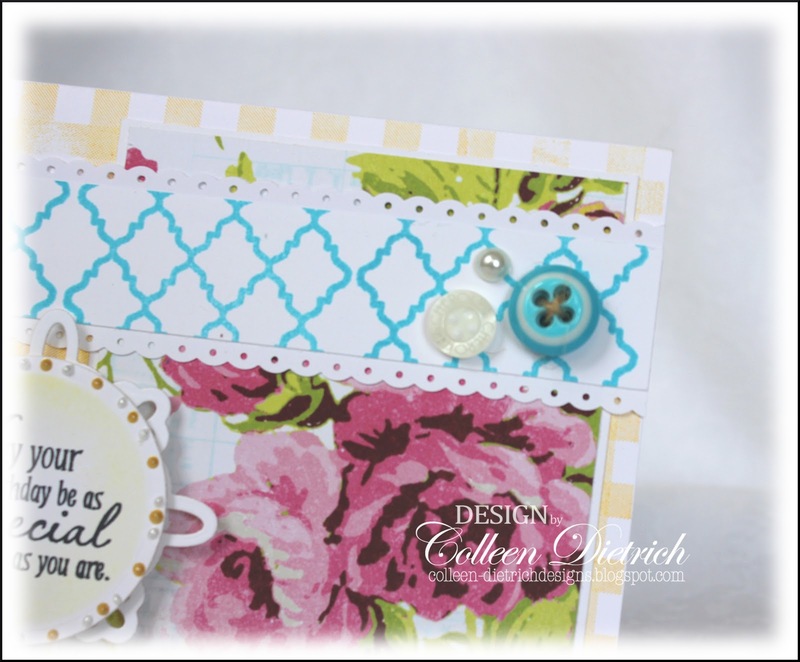 Behind the circle die cut is a Parisian Motif die cut. This card is headed north to one of my dearest friends, a stamping buddy. She is very special to me. 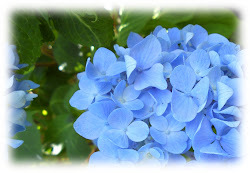 We met here in Blogland and have grown close. I still marvel at the generous, warm-hearted community of crafters I have met. I count myself blessed to know you all. Big hugs! Gorgeous - love the blooms! 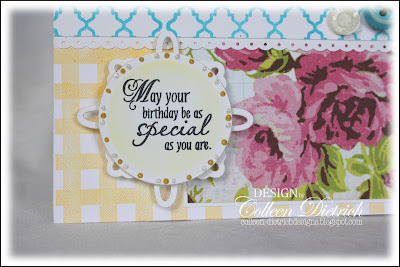 I ADORE this card, Colleen - the papers are wonderful together! A-MAZ-ING!!!! Love that you created your bg papers...they can get really expensive! 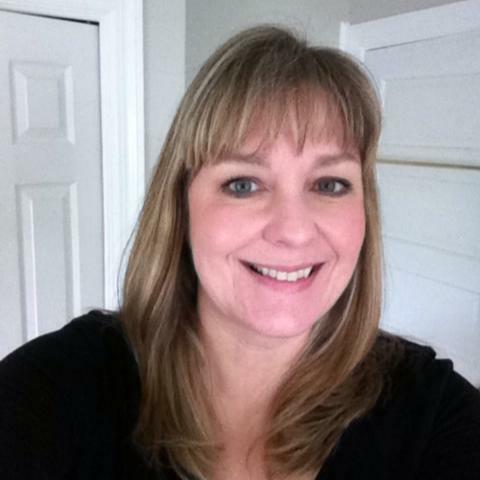 Love your inspiration photo,too! The colors are so beautiful! Beautiful card! I love your use of Liquid Pearls. So pretty! I love your inspiration picture and you captured it so well. 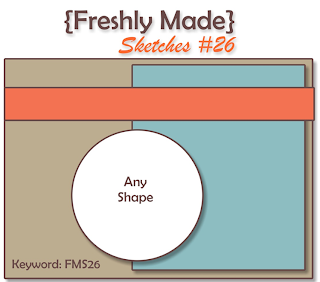 Glad you joined us at Freshly Made Sketches! Colleen, this is beautiful! Did you ever capture that middle sofa pillow. 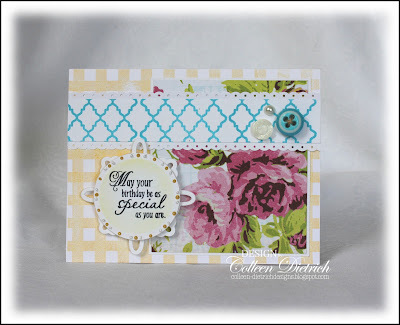 Wow, great card using your inspiration. I get Real Simple Magazine, and I remember looking at that page thinking it was not really me but just gorgeous. Cool card and interesting inspiration for it! You are the queen of stamps! This is fantastic! Love the different styles. Does remind me if a country pillow! Oh how pretty those colors are! I am fascinated at how you were inspired by a magazine page. I seriously need to up my game! Your papers are absolutely gorgeous and that sentiment is lovely. What a great card from that inspiration piece! Thanks for joining us at Freshly Made Sketches this week. Oh, how I love your Inspired By posts!!! It is always such fun for me to see how you picked up certain design elements from an eyecatching photo and translate them into a card design. You nailed all three themes from the photo perfectly in this beautiful card!!! Such pretty colors, interesting designs, fabulous details. And a destination up north? Hmmm . . .
Hopefully you and your mother are having a fab time! Awesome papers and colors! I see some die cut stacking...looks fabulous!